And this is exactly what I wrote about in “Tesla PR disaster…“. Journalists and analysts don’t know what to expect. I don’t pretend I can compete with Moody’s, but I can try to shine some light on pieces of the puzzle that are often misunderstood. In this series, I’ve focus on the manufacturing and communications, the cost advantage, and the way Tesla tries to collect as much cash as it can get. This is a very difficult article for me to write. I am a numbers guy and I like facts. But outside perhaps a dozen people at Tesla, nobody knows the facts. It is speculation upon rumor based on hearsay. What I can do is place the little things that we do know in perspective and speculate what the implication can be. What everybody has to realize is that Tesla needs volume production, not today or tomorrow, but soon. My guess is within about 6 months. That would be the same time GM needed to come to full speed, but Tesla does not have the same financial cushions as GM. It would be much better if the Model 3 line could reach break-even within this quarter. But we don’t know what volume level with what product mix would be break-even for the Model 3. The reason I do this speculative piece is that there is a lot of confusion about cash burn and losing money. I think it is certain that the Model 3 has been losing lots of money, but it could be that the current production of the Model 3 is close to cash neutral, or even cash positive. Tesla knows better than anybody else its financial situation, and that cash is king. What is not understood by many is that Tesla is doing something about that. At the moment, it milks the Model 3 for cash as hard as it can. The only version of the Model 3 is with the long range option for that reason, with all luxury added and as simple as possible to make. This version, produced in volume, should have a large impact on the Tesla cash flow. It could even make the Model 3 production cash-flow positive. Again, the marginal costs are my estimates — if they are wrong, it is my mistake. The main cause for the losses on the Model 3 are the high depreciation and amortization (D&A) costs. When you make 100 cars per day on an assembly line designed for 1,000 cars per day, the D&A costs are 10 times as high as they should be. The workforce is still in training, while logistics and procedures are in development, adding extra expenses to the production costs. The costs are real costs — the workers and suppliers have to be paid. D&A are also costs the accountants will see. But the cash does not leave the company, it is transferred on the balance sheet. This is why the current version is configured as it is. The costs of parts and labor leave the company, the costs for software and D&A stay in the company, as do the high margins on the Long Range and premium upgrade options. 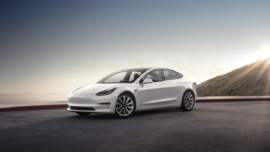 Tesla is in a race against the clock to produce as many cars of this version as it can. When the American reservation holders prefer to wait for the standard range or all-wheel drive versions, Tesla’s better financial move is to export her currently available cash cow to Canada, Europe, and eventually China. Tesla will wait as long as it can, or until production volume is significantly higher, before starting production on versions with less cash contribution. On a positive note, Tesla has the best idea of its actual financial situation. It is confident enough to start work at the Gigafactory to create a new parking area and free the section where the cars are now parked for future expansion. Opening Superchargers and new shops is also currently ongoing. Tesla clearly thinks the problems are under control. As is often the case, the rumors of Tesla’s demise are grossly exaggerated.